Japanese Smokers Feel the Pressure | Breathing Happy: Breathe. Blog. Be well. Several years back I had the pleasure of visiting Japan and China. Japan is one culture that respects the rights of others. As you stroll down the street you will not see people with a cigarette in hand. The first day I was in Japan I noticed how quiet everyone was on the street. You did not hear people talking with each other. What you saw instead was everyone had a cell phone in hand and was reading and sending text messages. Nobody on the street greeted you or even acknowledged you were there. You could enter a restaurant and all you could hear is quiet around you. It seems that the only conversation you heard was when the waiter asked you what you wanted to eat and you gave your order. On arriving in Japan and leaving the airport you did not see people lighting up a cigarette when they first stepped outside. What you saw instead was people walking to a glass enclosed room and standing around a table to smoke their cigarettes. The rooms were packed with people smoking cigarettes. This was the first time I had ever left an airport and did not see people standing around outside smoking cigarettes. 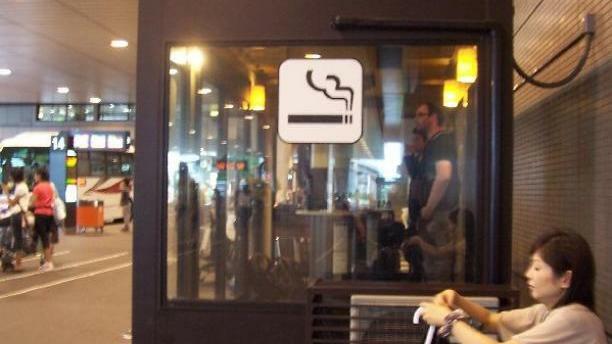 What I saw was no smoking signs all over the exit of the airport and signs pointing to a designated smoking area. As you passed this area you did not smell the cigarette smoke from this room. The room was well filtered and the smoke was drawn out through a special hose at the top of the glass enclosure. As the days passed I started to notice on the street painted on the sidewalks no smoking signs. In Japan they do not allow anyone to smoke on the streets in a large business area. If you want to smoke you are forced to find a smoking room or a designated smoker's park. This was the first city I have ever visited that was controlling smoking in public. It was nice to walk the streets of Japan and not see cigarette butts thrown on the sidewalks and in the gutters. It was also nice to visit Japan and not have a person walking in front of you smoking a cigarette and blowing the smoke your way. In the recent years Japan has dramatically changed their attitudes towards smoking in public places. In years past it was a common sight to see someone walking down the street with a cigarette in hand. Today smokers have adapted to a much politer approach to smoking in public. Many non smokers in Japan are pushing for a smoke free environment. Many of the non-smokers are pushing for stricter laws for people who smoke. They are trying to push smokers into corners and ostracize them for lighting up. Anti-smokers in Japan are pushing for a smoke free environment. In December of 2012 a woman filed a complaint in Nagoya District Court against her neighbor. The neighbor would go out on his balcony each morning to have a cigarette. The woman claimed in her suit that the smoke was creating stress that affected her both mental and physically. The suit was filed on the grounds that the man did not consider the effects of his behavior on those around him; the man was breaching the law. The court fined in her favor and the man was ordered to pay 50,000 yen for her for inflicting mental anguish. What has caused Japan to change in the past few years? Before Japan was the leader in the tobacco industry. All over Japan you will find vending machines that sell cigarettes. The vending machines were the heaven for teenager smokers. Japan law states that nobody under the age of 20 can purchase cigarettes. The teenagers found the vending machines a way to get around this law. In order to control the purchase of cigarettes from vending machine each smoker had to register. The smoker had to show proof of his age and was given a card to use in vending machines. The card was similar to a bracelet that you would receive when entering an amusement park. Japan had one of the highest smokers' populations in the world. Not today all efforts are being made to stop people from smoking. Yet the price to purchase a pack of cigarettes is the lowest in the world. The change started when the Democratic Party came into power. At this time the Japanese Government has started to place emphasis on anti-smoking measures. Yoko Komiyama the leaders of anti-smoking measure in parliament, was elected Minister of Health, Labor, and Welfare. Around the world smoking restrictions are being implemented. There is concrete scientific evidence that proves smoking is dangerous to your health and the ones around you. The public of Japan is concerned now that anti-smokers are pushing for much stronger laws. They feel that the new anti-smoking measures are ranked higher than the social problems Japan is facing right now. Many of the problems after the earthquake have not been resolved and the Minister of Health, Labor, and Welfare are concentrating more on enforcing new anti-smoking laws than helping the people in the contaminated areas after the nuclear disaster. In 2010 Japan was far behind the rest of the world in implementing anti-smoking laws. At this time there were no nationwide smoke-free regulations in Japan. The move for reform in Japan was opposed by the powerful lobby groups. Japan laws forbid smoking on the streets of Chiyoda, Shinagawa, Shinjuku, and Nakano wards of Tokyo. These public streets were designated as non-smoking streets for child safety and not for public health. All public transportation and subway prohibit smoking on platforms. But at the same time all above ground train station platforms have smoking areas. Kanagawa Prefecture in 2010 implemented a new anti-smoking law prohibiting smoking in public facilities, including hospital, schools and government office. These laws had been in effect around the world since the late 1970's and early 1980's. Japan had only implemented these regulations in 2010. In America restaurants, hotels, and bars have been smoke free for years. Japan in 2010 required large restaurants and hotels to choose whether to become non-smoking or create special smoking area. Two years later Japan has stricter non-smoking law. The lawsuit won in December of 2012 proves that Japan is serious about the health of others and smoking in public. Today when you visit Japan you will find a healthier environment when walking down the streets. Smoking is not allowed in public areas and special designated smokers booths are set up for people who wish to light up. Previous ArticleTriggering a Life ChangeNext ArticleThanks, Dad!